Frank created a buzz, something to be captured by, while this is true for many, they’ve also garnered some people that weren’t too crazy and in some cases outright voiceful. Now that Frank has gone live with the campaign, let’s check out what this is all about. By now, we all know that Frank is just another phone. The device features an aluminium body with a nice 5.5-inch 1080P display that is sharp, clean, very colour-accurate and not bad under direct sunlight. 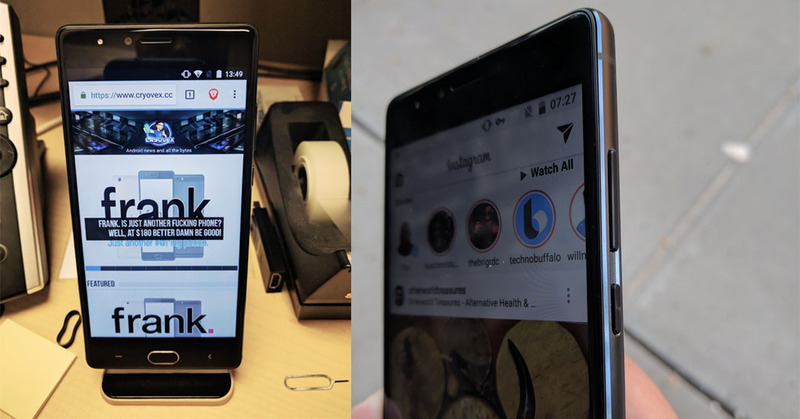 Frank is equipped with an Octa-core MediaTek processor (MTK6750T) which runs at 1.5GHz and to help it achieve all the Bussells your applications may have is a nice whopping 4GB of RAM. A nice middle ground between 3GB and 6GB was needed, right? Keeping in line with the notion that people like to just be able to take their smartphone out of their pockets to take some pictures, we are greeted with a 16-megapixel rear camera with an aperture of 2.0, while the front facing camera provides us with a nice 8-megapixel with a 2.2 aperture. Ok, I know might be the end all and be all, but, the onboard flash storage offers 64GB with an expandable microSD card up to 128GB which is more than enough for the average consumer. If you add some extra feature like USB-C 2A fast charging and a nice 3000mAh battery you’re pretty much set. I do have to mention that the bottom firing speaker was loud enough, however, I would have preferred double front stereo speakers on my device. One last bit about Frank, it comes with a fingerprint sensor which is pretty accurate and fast. I didn’t experience problems, I do however experience the same hit and miss that occurs with these type of sensors, but overall the experience was good. I must say that when it came to taking pictures with the camera it was a hit and miss scenario, however, isn’t that how it works for the most part? I noticed that by replacing the default camera app with something else, I was able to get better pictures on almost every count. Selfies were good and the pictures I took, for the most part, we’re decent. The early bird special is listed at $180 USD and the regular price for the device will run at $279 USD. I was provided with a device for little over a week to play with. Of course, this was pre-production and not the final version as it was running Android 6. However, the SKIN was minimal, very much closer to stock experience and it was just fantastic to use. Right out of the box it was well presented. The final product will have minimal UI changes and will feature Android 7. I compared it to my daily driver the Nexus 6P and it was on par and most cases actually performed better. The team at Frank is still exploring the idea of Android 8.0 for their current first-run, but users can likely expect quarterly security updates. While my experience is my own, I’m sure that a device like Frank is more than capable to the majority of the consumer market. Some of you might be sceptics about this new company on the market and I understand your concerns. Let’s give them a chance to get off the ground and see what comes out of it.